Visit the global Rio Tinto archives for posts from all DGR sites. For nearly a decade, Resolution Copper Mining, a subsidiary of British-Australian mining conglomerate Rio Tinto, had unsuccessfully sought ownership of Oak Flat Campground. Yet, on December 19, 2014, with the help of Senator John McCain, the Southeast Arizona Land Exchange and Conservation Act of 2013 resurfaced within the National Defense Authorization Act (NDAA) and was successfully passed by the Senate and signed off by President Obama . The new legislation will open up Oak Flat for copper mining. As part of the deal, Resolution Copper will swap roughly 7.8 square miles of land scattered across Arizona for roughly 3.8 square miles of Tonto National Forest, which includes Oak Flat. Resolution Copper is required to work with the U.S. Forest Service to do an environmental impact study, however, they are guaranteed to get the land, regardless of what the study shows. Also, the company has chosen a cheaper method of extraction called block cave mining. The aftermath of the mining will result in a crater two miles wide and up to 1,000 feet deep, destroying the surface of the land as well as generate nearly a cubic mile of mine waste. This entry was posted in Mining & Drilling and tagged Apache, Bills & laws, Copper, Oak Flat, Rio Tinto, Video, 11: Civilization is a culture of occupation on March 3, 2015 by DGR Colorado Plateau. As the morning sun rose high enough to burn off the chilly overnight temperatures, mesquite fires scattered throughout the Oak Flats Campground offered a warm welcome to a special day for Arizona’s San Carlos Apache tribe. 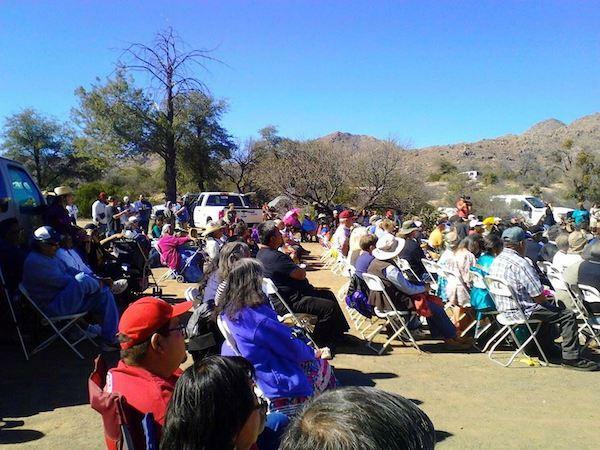 Protesters gathered for a day of spiritual succor at Oak Flat, the sacred Apache site that was all but handed over to Resolution Copper in the latest must-pass federal defense-spending bill. Some 300 tribal members and supporters from across the country had gathered to protest the infringement of traditional Apache holy lands. There were Chippewa, Navajo, Lumbi, Pauite, Havasupai, and representatives of the National American Indian Movement and the National American Indian Veterans group, as well as non-indigenous supporters representing myriad concerns including those of environmentalists and other lovers of nature. All were furious at Congress’s sneaky transfer of sacred Apache land to a mining company and vowing to do what they could to see that it didn’t happen. “What was once a struggle to protect our most sacred site is now a battle,” said San Carlos Apache Tribal Chairman Terry Rambler, organizer of the grassroots movement aimed at stopping transfer of hundreds of acres of ceremonial land to those who would dig a mile-wide hole in the ground in a search for copper. Arizona’s Apache Tribe represents a culturally rich society with heritage tied to Mother Earth. As a people, they extend a Hon Dah welcome greeting to all who wish to share their culture and history. But now they are fighting to keep their holy lands culturally sacrosanct. “Our homelands continue to be taken away,” said former San Carlos Chairman Wendsler Nosie Sr., decrying what he termed the dirty way in which a land-swap rider had been attached to a must-pass bill that sailed through Congress and was signed into law by President Barack Obama. The amended legislation, with the support of Arizona Senator John McCain, was “an action that constitutes a holy war, where tribes must stand in unity and fight to the very end,” according to Nosie. The legislation that the former chairman termed “the greatest sin of the world” is the Southeast Arizona Land Exchange and Conservation Act, which gives a 2,400-acre tribally sacred site to a global mining entity, Resolution Copper, that wants to destroy its natural state with a massive mine intended to extract an ore body located 7,000 feet below ground level. That ground is hallowed to the Apache peoples whose reservation border is just east of the proposed mine at Oak Flat, home to Indigenous Peoples since prehistoric times, a place where acorns and medicinal herbs are gathered and coming-of-age ceremonies are held. Kicked off by earlier protests in both Tucson and outside Senator McCain’s Phoenix office, the multi-pronged awareness approach to mitigate the potential fate of Oak Flat picked up momentum via a two-day, 44-mile, march from the San Carlos tribal headquarters and culminated in a weekend-long Gathering of Nations Holy Ground Ceremony, “A Spiritual Journey to a Sacred Unity,” at Oak Flat. Following a holy ground blessing, the morning was filled with traditional, cultural and religious dances, with Rambler dancing and Wendsler joining the group of drummers. The weekend of solidarity was epitomized by guest speaker and activist preacher John Mendez. The Apache struggle has become part of the ongoing battle worldwide for Indigenous Peoples protecting sites that are sacred to them because of the places’ importance to both spiritual and physical survival. Despite Obama’s signature on the measure, the administration has expressed displeasure as to how the legislation flew under the radar to become law. “I am profoundly disappointed with the provision of the bill that has no regard for lands considered sacred by nearby Indian tribes,” said U.S. Secretary of the Interior Sally Jewell. The passage has created numerous schisms. “The nearly decade-long fight over access to the federally protected land has ignited a feud that has split families and ended lifelong friendships,” the Los Angeles Times noted. It also has united those who oppose Rambler, and the ongoing, nearly 10-year-old struggle has garnered support from more than 500 tribes, many who face similar situations with mining or development proposed in areas that other Native Americans consider holy. If this can happen to the Apache nation, it can happen to any other nation was the general feeling. “We have a similar situation with an effort to build a tramway down to the bottom of the Grand Canyon,” said Lorenzo Robbins, a Navajo from Northern Arizona. Rambler, welcoming the support, said it is indeed everyone’s battle. “We must stand together and fight,” Rambler said. “We’re drawing a line in the sand on this one. We’re against this specific project because it’s going to desecrate and destroy this whole area and the Apache way of life we are accustomed to. This entry was posted in Indigenous Autonomy, Mining & Drilling, Protests & Symbolic Acts and tagged Apache, Bills & laws, Copper, Navajo, Oak Flat, Paiute, Religion & Spirituality, Rio Tinto, 11: Civilization is a culture of occupation on February 12, 2015 by DGR Colorado Plateau. When former miner Roy Chavez heard about plans to develop the nation’s largest copper mine near Superior, Ariz., he thought it might be the salvation of the economically struggling town where he’d grown up and served as mayor. But as he learned more about the proposal to tap an ore body more than 7,000 feet deep with a method known as “block cave” mining, he changed his mind. Now he fears that the project would be environmentally destructive and limit Superior’s ability to develop tourism and other industries. Resolution Copper Mining, a firm owned by subsidiaries of international mining giants Rio Tinto and BHP Billiton, is seeking a land swap with the federal government that would give it ownership of 2,400 acres in the Tonto National Forest, where the rich mineral vein was discovered a decade ago. In return, Resolution Copper would give the public more than 5,500 acres of land it owns in various parcels around the region. But the land the company wants to mine includes popular rock-climbing areas and Oak Flat Campground, which President Dwight D. Eisenhower in 1955 designated off-limits to mining. Native American tribes consider much of the area sacred, and they worry about earth caving in and damaging landmarks such as Apache Leap, where warriors are said to have jumped to their deaths rather than surrender to Arizona soldiers. The proposed mining area is also home to at least one federally listed endangered species, the Arizona hedgehog cactus. Resolution Copper says the mine would become the country’s largest source of copper – supplying half a billion tons a year and meeting a fifth of national demand for 50 years. It would also employ 1,400 people on-site during peak operations, for an estimated total economic impact of $46.4 billion during its 66-year lifetime, according to the company. To secure the land swap, Arizona Sens. John McCain (R) and Jon Kyl (R) introduced legislation in 2009.Senate Majority Leader Harry M. Reid (D-Nev.) added authorization of the deal to the America’s Great Outdoors Act of 2010, an omnibus lands bill that was pulled in late December in the face of Republican opposition. While McCain’s 2009 bill would have basically ensured the land transfer, Reid’s would have authorized the land swap with final approval contingent on the environmental assessment process mandated by the National Environmental Policy Act and approval from the secretary of the interior. Jon Cherry, Resolution Copper vice president for legal, external and environmental affairs, said the company is confident legislation similar to Reid’s bill will pass in 2011. Along with McCain and Kyl, Rep.-elect Paul Gosar (R-Ariz.) supports the project and recently toured the mine site. Superior Mayor Michael Hing said the mine would make a “night and day” difference for the town that he’s watched shrink to less than half its former size – currently about 3,200 residents – since the Magma mine closed. Hing’s grandfather came to the area from China in the 1920s to start small businesses serving miners. But Chavez, who now works as a planning consultant and owns a bar, and other opponents say the mine would destroy the landscape, severely affect tourism and potentially contaminate groundwater. They are particularly concerned about the block-cave method, which involves blasting a space below the ore body and using gravity to harvest the ore. This leaves large empty cavities underground. There are several other block-cave copper mines in the region, 60 miles east of Phoenix, causing the surface to collapse and crack in some areas. In an e-mail, Cherry said the company is doing studies to ensure that groundwater will not be contaminated and that natural features such as Apache Leap will not be harmed. He said the mine would increase rather than reduce tourism, and that part of the land swap involves the company transferring land ideal for rock climbing to the public. Mine opponents note that the U.S. Forest Service regularly grants mining concessions on public land and say Resolution Copper should seek one rather than taking ownership of the land. They fear that if Resolution Copper owns the land, environmental impact studies will be less comprehensive and not open to public scrutiny. Cherry said the company needs the land swap to carry out the environmental assessments and petition for permission to mine. Resolution Copper has launched a social media campaign to build public support for the land transfer, including YouTube videos and Facebook groups. Cherry said company polling showed more than 80 percent of locals support the mine. But Daniel Patterson, a Democratic state representative out of Tucson and southwest director for the group Public Employees for Environmental Responsibility, said Arizonans are wary of privatizing public land. He called environmental and recreational concerns misguided in a state that has staked its identity on mining for more than a century. A report from the Arizona Mining Association says the industry had $3 billion in statewide direct economic impact in 2009 – employing 9,100 people, paying $151 million to state and local governments and spending more than $2 billion on goods and services from Arizona businesses. This entry was posted in Mining & Drilling and tagged Bills & laws, Conservation & preserves, Copper, Endangered species, Oak Flat, Rio Tinto, 11: Civilization is a culture of occupation on January 14, 2015 by DGR Colorado Plateau. On December 19, 2014, President Obama signed the National defense Authorization Act into law. The bill contained the Oak Flat land exchange. This particular version of the land exchange was the 13th since the bill was first introduced in Congress by convicted former Congressman, Rick Renzi in 2005. Senator Flake, who previously worked for Rio Tinto at their uranium mine (co-owned by the Iranian government) in Namibia, acknowledged what we all knew, the bill could not pass the US Congress on its own merits. This is the culmination of 10 years of work by Arizona’s Senators and some Congressmen at the behest of Rio Tinto and represents a huge Christmas present for the international mining giant. However, the bill’s passing is a lump of coal in the stocking of all Arizonians. Senators McCain, and Flake did their best to subvert the will not only of Native American Tribes, conservation organizations, the Superior Town Council, and others, but the will of the United States Congress who has forcefully rejected the land exchange for nearly 10 years. This new version of the bill does not turn over Oak Flat to Rio Tinto until 60 days after the publishing of a Final Environmental Impact Statement. While this represents a major departure from normal procedure and limits any ability to mitigate or say no to the proposed mine, it does allow additional time, as the US Forest Service will go through the motions of conducting the process mandated by the National Environmental Policy act (NEPA). This process will take years and will allow opportunities for this mistake to be rectified. Until that time, Oak Flat remains public land owned by all Americans free to be enjoyed and celebrated by all. Rio Tinto and its supporters would like to think that this dirty underhanded deal will make our opposition go away, but nothing will be further from the truth. Rio Tinto has finally shown how much it cares for the rule and process of law. Like a schoolyard bully, Rio Tinto threw a tantrum until it finally got its way. But in the process, the company showed its true colors. Folks from all walks of life and from across this great nation and indeed, the world, are rising up against this miscarriage of justice and are clamoring to help us protect Oak Flat. The passage of the land exchange marks the end of but one phase of our struggle to protect Oak Flat. We have many avenues to protect Oak Flat and we will travel them all until we succeed. These and many other powerful and well-spoken people are clear in their displeasure over Rio Tinto’s actions. This entry was posted in Mining & Drilling and tagged Apache, Bills & laws, Copper, Oak Flat, Rio Tinto, 11: Civilization is a culture of occupation on January 9, 2015 by DGR Colorado Plateau. James Anaya: Rio Tinto should make some lands off limits to mining and abandon the project if it can’t gain local support. Congress recently authorized an exchange of land so the multinational giant Rio Tinto can proceed with its Resolution Copper Mine project in eastern Arizona. The land to be conveyed to the company was taken from the Apache people more than a century ago, but Apache today continue to claim strong cultural and religious ties to the land. The congressional authorization can be seen as a victory for the foreign-owned mining company. At the same time, it represents a shameful circumventing of democratic process in the face of environmental concerns and potential violations of the religious and cultural rights of the Apache people. The San Carlos Apache Tribe, with numerous other Indian tribes across the country, had successfully opposed stand-alone legislation for the land swap because of these fundamental human-rights concerns. Leaders in Superior had voted to revoke support for the mine. The mining company, however, convinced key members of the Arizona congressional delegation to authorize the land swap through an amendment buried in the must-pass National Defense Appropriations Act. The new legislation does not make the land swap immediately effective. Several steps will have to be completed, including an extensive process of environmental review and consultations. Still, it makes the land swap and eventual mining appear to be a foregone conclusion. Proponents of the mine, including Sen. John McCain, have stressed that the project will lead to needed jobs and generate significant economic activity. But whether or not the American people or Arizonans will fairly benefit economically in comparison with what the foreign company will profit remains highly debatable. In any case, most Americans understand that the prospect of jobs or economic gain for some cannot alone carry the day, lest all those places rich in natural or cultural bounty that have been set aside as national treasures would be at risk. The owners of the Resolution Mine project, Rio Tinto and BHP Billiton, subscribe to guidelines adopted by the International Council on Mining and Metals establishing, in keeping with United Nations standards, that mining companies should work to obtain the free, prior and informed consent of indigenous peoples and ensure full respect for their rights, as preconditions to the implementation of mining projects that affect them. Rio Tinto, especially, has worked to follow these guidelines with a number of its projects around the world, building what many human rights and environmental advocates consider to be good practices. But the land swap authorization for Resolution Mine was not predicated on the San Carlos Apache’s consent or widespread local support. Instead, the congressional authorization came amid continuing disagreement about the environmental and cultural impacts of the land swap and eventual mining, through a truncated legislative process that altogether avoided confronting the points of disagreement. Any chances of now meeting local concerns and coming to an agreement with the tribe have been severely damaged. The only way that those chances might be bettered is for the company to make clear it understands that some places, because of their religious or cultural significance or environmental sensitivities, are simply off limits to mining, and to commit to refraining from moving forward with the land swap or any mining without broad local community support and agreement with the tribe. The company should be prepared to alter its planned land swap and mining activity, or altogether abandon it, if the company cannot obtain the social license that broad local support and agreement with the tribe would provide. S. James Anaya is a Regents’ Professor at the University of Arizona Rogers College of Law. He served as the United Nations Human Rights Council’s special rapporteur on the rights of indigenous peoples from 2008 to 2014. This entry was posted in Colonialism & Conquest, Mining & Drilling and tagged Apache, Copper, Oak Flat, Rio Tinto, 11: Civilization is a culture of occupation on December 31, 2014 by DGR Colorado Plateau.